From my last post we learned how to say hello in Thai, so let’s continue from there. Let’s begin your first Thai conversation with this nice and lovely greeting question . 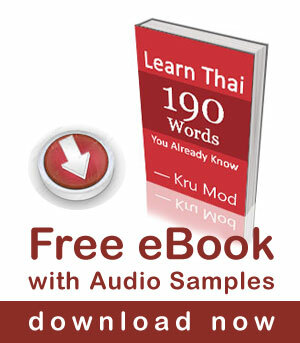 Now you can start greeting your Thai friends with Thai greeting. I feel good about learning from your lesson. Maybe the video was moved. I look forward to see it. ( สบาย(ดี) มั้ย? ) <– looks like I learning quite fast. สวัสดีค่ะ Ruumi, my old YouTube channel has been suspended, but I have a new channel called “ThaiwithMod”. Please don’t forget to subscribe. I re-upload some of the videos from the old channel to the new one already. I will continue to load more, but it takes some time to edit them. I wanted to say thank you, for helping me see the video. and yes, I will be sure to subscribe. The way you teach is clear, friendly, alluring, and fun. Hi Mod, there are other ways to say “hello”. Which of the following is used colloquially, which is informal?